Why I Decided to Enter a Beauty Pageant at the Age of 68 – Jane G. Goldberg, Ph.D. Article originally appeared on HuffingtonPost.com. In early 2014, I made a most bizarre decision for myself. I committed to participating as a contestant in a pageant: the Miss Senior New Jersey Pageant. This description boded well for me, as my outer beauty has never been much of a concern for me. Of course, I like to look good. But, there are the indisputable facts that I rarely brush my hair during the course of the day (once in the morning seems sufficient for me); I haven’t worn lipstick or make-up for the last 40 years; I haven’t worn earrings in two decades (quit them when my daughter was an infant and kept tugging on them); I have worn a dress only a handful of times in the last 20 years (prefer leggings, with sandals in the summer/boots in the winter). Yet, something about this endeavor called out to me. Probably it was a desire to share an experience with my now 21-year-old daughter who, unlike me, never leaves the house without make-up. She has a sense of fashion that I couldn’t replicate with all the money in the world, is able to wear shoes that defy gravity, and who I knew would come down from Vermont, where she is in college, to see me do this. This was going to be fun. We are so very different from one another, this daughter and I. She is so very and naturally beautiful, has great concern for how she looks, and makes effort for it; although I look relatively good for my age, 68, I have little concern for it, and put minimal effort into it. We are so different, and yet, so close. I wanted to do this thing with her, for her, and because of her. I committed fully to the process. There was great preparation for the event. I had to find a dress; I had to do something with my unruly, largely uncombed hair; and most challenging, I had to find a talent. I was sent paperwork that defined how I needed to prepare. There are four criteria for the judges: personal interview (30 percent of the score); evening gown (20 percent); inner beauty, also called “Philosophy of Life” (20 percent); talent (30 percent). I have kept all my mother’s exquisite gowns from weddings and bar mitzvahs, sitting in a trunk since her death 30 years ago. One by one, I pulled them out of their dusty storage, tried them on, took selfies to send to my daughter via email for a yay or nay. None of those worked well enough for my daughter to give a thumbs up. For some of them, she actually stuck her finger down her throat (Skype) — I was a little hurt for my mother’s sake, but then again, the gowns were decades old. We decided I needed a new gown. I ordered five gowns online. One by one, they arrived, and my daughter and I repeated the selfies process. I found an elegant sequined gown (again, hiding my tummy, that I called my “special-effects-evening gown”) that we both liked. That was the one I kept. In preparation for the talent part of the competition, I did some homework: I looked at videos of past pageants. It was a difficult decision to make for what talent to present, as I am essentially talentless. I am not without accomplishments, being a well-known psychoanalyst and author (uses of my mind), and a long-distance swimmer and advanced yoga practitioner (uses of my body). But talent, as in singing and dancing, or performing? I haven’t done that kind of thing since I was a strawberry in a dance recital at age six. Watching the videos of past pageants was daunting: some of the women were good, singers and dancers who had real performance charisma. I considered pulling my application. Yet, soldier on I did. For my “talent,” I tacked together a multimedia performance. It was, in essence, a homage to my mother. She became the organizing principle of my various “talents,” because it was she who encouraged my artistic endeavors (which I showed in a slide show: paintings, drawings and photographs I had made over the years); it was she who listened to my practicing the piano for hours each day (I played a piece I had learned as a teenager); and it was she who proudly announced to anyone listening, even taxi drivers and strangers on the street, when I had authored my first book (I did a short reading from my most recent book). The day of: Harrah’s in Atlantic City. Our first event was the private interview with the judges. Although this counted heavily in the scoring, there was no way to prepare for this event, as we did not know what questions the judges would ask us. Five esteemed individuals had volunteered to be the judges. I gussied up for the interview: fussed with my hair, checked my makeup, wore a new dress that made me look sleek and lithe, and actually wore heels for the occasion — the first time I had had heels on in 45 years. I entered the room without tripping, sat down, got myself poised with legs appropriately crossed in lady-like fashion, and prepared to answer their questions. The first question I was asked, by one of the male judges, was about my writing for The Huffington Post, an activity I had mentioned on my application. As I began my answer, something odd happened: the judge who had asked the question looked down at the floor. As I continued to respond to that question, and the others posed to me, I made sure that I made frequent eye contact with each of the judges. Yet, this one judge never looked up, never took his eyes off the floor, refusing to make eye contact with me for the rest of my interview. His behavior was unwelcoming, disconcerting, even rude. Next: learning and rehearsing our ensemble dance, and the movements on stage. We practiced strutting, learned a pageant walk with arms swinging straight out and hands at 90 degree angle from arms; we belted out our hellos again and again, proudly announcing which municipality we came from: I, from “small but beautiful Bloomingdale.” We learned our dance steps, where to enter and exit the stage. And, finally, we got one practice run-through of our talent presentations. By the time the pageant actually started, we were all rather frazzled and tired from the efforts of memorization. My main concern was what I would remember, or the alternative: forget. Surely memorization was a skill most of us had not exercised for many decades, and the one I was most worried about. I wondered: was my forever-dreaded anticipatory Alzheimer’s going to finally make its appearance at just the moment of my stepping up to the microphone? As I stood at the podium, reciting my “Philosophy of Life” statement, I felt proud and happy to be there. I was satisfied with the thought that had gone into my composing words that reflected the very personal meaning of my being there, participating in a contest that was so foreign to my usual self-identity. By the end of the pageant, we contestants had spent many hours together, had gotten to know one another, and, in a sense, even come to “love” each other. I made two BFFs for the day (never to be seen again, in all likelihood). Geraldine is a 78-year-old woman, who like myself, is a pianist and psychologist. We had an immediate attraction to one another because we were the only pianists in the bunch, and shared a profession. Geraldine decided to do this as an activity that would give her something interesting and new to do, since her husband had died. My other best friend for the day was my next door neighbor in the dressing room, Teri, who took me aside mid-day, and confided that I was not the only Jew there. (Except for Bess Myerson, the 1945 Miss America winner, pageants are not typically a Jewish-thing to do.) Teri’s motivation for entering was about her commitment to a social cause. Her husband had had a severe heart attack while they were on vacation some years earlier; he had immediate heart surgery, and then a transplant that saved his life. They are both advocates for organ donors, and Teri entered the pageant out of hopes of giving herself a public voice for transplant advocacy. Beverly had been diagnosed with pancreatic cancer. She had taken the trouble to call me a few weeks before the pageant, on my birthday, to wish me a good day. In spite of her illness, she wanted to be there, and put on an amazing but ridiculous costume, and then moved slightly on the floor for her “talent” performance. Mary’s knee kept locking up. It was difficult for Mary to move, and the group dance was challenging for her. Yet, she persisted, and we collectively made adjustments for her. Patricia had had a stroke, and couldn’t see for three years. She explained that her recovery was due to “divine intervention.” She said she was in church and, all of a sudden, could see again. She was a thoughtful, serious woman, yet a brilliant comedienne. Diane, Patty, and a few others had competed several times. It was a process they enjoyed, looked forward to each year. Of course they wanted to win. But, win or lose, they wanted to participate. Many of the women had real talent. Mary let loose the first two notes of “At Last,” and the audience went wild. They were on their feet cheering her on. Those two notes were powerful and rich, surprisingly commanding. Geri was a flutist, and her playing was sweetly evocative. My BFF, Geraldine, played the piano with enthusiasm and skill. I didn’t win. I didn’t even place. I found myself feeling oddly disappointed. I hadn’t really expected to win. I’m not sure I even wanted to win. I wanted the tiara; I wanted the sash; I wanted to walk out on the streets with my tiara and sash. But I did not want to carve out time from my busy schedule to make expected appearances at small town festivities, parades, and launching of ships-kind-of-things. But I did think I deserved a place. Out of 14 contestants, there were four runners-up (altogether, five winners). As I stood on the stage, listening to the winners being announced, I hoped that I would receive some recognition, that I would be rewarded for what I thought had been a good show on my part. I not only look good for my age, I feel fantastic. I have defied my genetic destiny; my mother and sister were both dead of cancer long before they reached the age I am now. I have achieved this feat through diligence, discipline, study, applying principles of health to my life-style. I think I exuded my feel-good/grab-life-by-the-horns attitude on the stage. Yet, I came to understand that none of these qualities that I feel I embody — my “off-stage” abilities, assets, attributes, intelligence, virtues, accomplishments, even talent — that comprise the full person I am — indeed, the person I have made myself into being — these qualities that I think of as going into the “mark” of a woman — none of them mattered to the judges. These more ephemeral qualities are the ones that had been reflected in my written application, which each of the judges had reviewed. The judges are meant to understand that there are lives lived beyond the performance on the stage. They are meant to take these qualities into consideration in their judging criteria; and I had gone into the pageant believing that the life I have chosen to live would be recognized as worthy of acknowledgement. Yet, it appears that to be a winner, in New Jersey, only one attribute matters: the ability to sing. People look at me oddly when I sing. In fact, in my talent presentation, I made fun of my inability to sing or dance. But, in the history of this pageant, as far as I can tell, no contestant has ever won who does not sing. I thought deeply before I decided to send an email to the administrator of the contest, Johanne. I suggested that having five winners in a field of 14 leads to disappointment, if not outright humiliation, to not get any recognition at all. I thought that in the future, they might want to narrow the field of runners-up to make losing less embarrassing. Or, alternatively, give awards for other accomplishments, as in an award for Miss Congeniality (I would have been happy with “Most Well-Read”). Johanne thanked me graciously for my suggestion, and told me that they had concluded that this didn’t work. She said that it was called “tokenism” for non-winners, and was viewed as an insult. I, however, would have experienced it as acknowledgement. I cc’d both my email and Johanne’s response to all the contestants. My letter created a subsequent firestorm of complaints amongst those who did not place. We, the “losers” in the group, began talking forthrightly about our experiences. We called ourselves the Malcontents, and in our emails to each other, we decided that we were engaging in a form of group therapy. I was the designated official Malcontents Psychologist. One of the complaints was that the pageant itself was three hours. Yet, we contestants each had approximately 225 seconds in front of the audience to present ourselves as distinct from the pack (3 minutes 45 seconds for the talent; 45 seconds for the Philosophy of Life, 5 seconds for announcing our town). 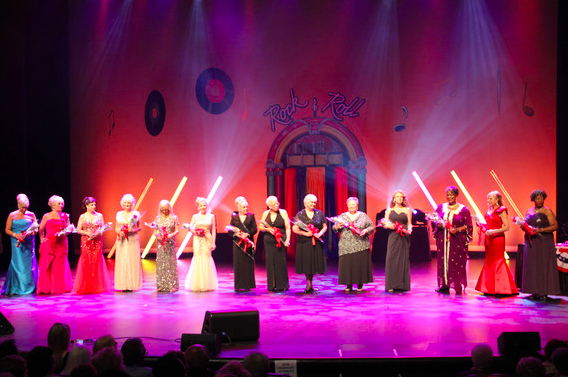 Most of the pageant time was taken up by former winners, the Queens of past years: they were continuously talking, singing and dancing on stage. They were ubiquitous. Ultimately, the lesson I took away from being in the pageant was the same sentiment I expressed in my “Philosophy of Life” statement. For me, the meaning of the experience was about spending hours and hours with my fellow contestants, learning a dance, supporting each other when any of us forgot which way to turn and messed up the whole routine. And the time in the dressing room, side by side: sharing lipsticks; doing each other’s hair; deciding for a neighbor one dangling rhinestone earring over another less dangling. Primping and prepping, and doing it together as a group, non-competitively, just lovingly and supportively — as I said in my “Philosophy of Life”: the “bond of womanhood.” Not with women who are naturally attractive simply because of their youth, nor who still have great thick hair and smooth clear skin, but, rather, with women who are fighting every day in every way against their aging bodies — both in terms of beauty and also just getting around with weak knees and decades long backaches, and even the specter of encroaching death. That’s what moved me the most. I’m glad I entered the competition. My daughter and I shared a wonderful, exhilarating experience. She got to see, for the first time, how her aging mom looks in an evening gown, makeup, with hair extensions and false eyelashes. I got to see the pride reflected back to me from her eyes, not because she has a mom who looks good for her age, but because she has a mom who had the courage to participate in such an endeavor, and the joie de vivre to actually enjoy it. One of my friends who had come to see the event sent me a tiara, and told me I was her queen. I trounced around the house for a week, wearing the crown every time there was no one around to witness my foolishness. I had a great time. I will never do it again.